Tom and I had spent the night at our usual location off Moenkopi Rd, between the Red Rock CG and SR159. This was the first of three full days I had to devote to the fine sandstone scrambling found in Red Rock NRA west of Las Vegas, and I hoped to make a dent on the remaining 8 of 59 summits in this area described in Courtney's Rambles & Scrambles. The morning's agenda included two relatively modest outings with a good amount of fun class 3 scrambling. The afternoon's outing was a mellower affair, mostly a hike from the backside of the range that takes advantage of a good trail found there. The four peaks kept us busy for the entire day - what more could we ask? Leaving my van at the Late Night TH, we drove Tom's Jeep out to the Black Velvet TH. It is a popular climbers' TH, used for the ever-popular Epinephrine and other routes on Black Velvet and Whiskey Peak. Burlap Buttress is sandwiched between Black Velvet to the south and The Monument to the north, lower than either of its close neighbors. We plied the well-used climbers' trail for perhaps half a mile before forking off to cross the Black Velvet Wash and make our way up to the base of Burlap Buttress's SE Ridge. Courtney's description of the route up "Burlap's prominent east gully near the mouth of Black Velvet Canyon" is more than a little misleading. The correct gully isn't at all prominent from the TH, hidden from view by Burlap's SE Ridge. And it isn't near the mouth of Black Velvet Canyon, at least the main South Fork that is prominent from the start. We spent some time at the base of the SE Ridge looking at various chutes and gullies that showed no sign of easy access and no signs of regular traffic. Changing course, we contoured on a good use trail to the north around the SE Ridge, eventually finding our way to the east gully. 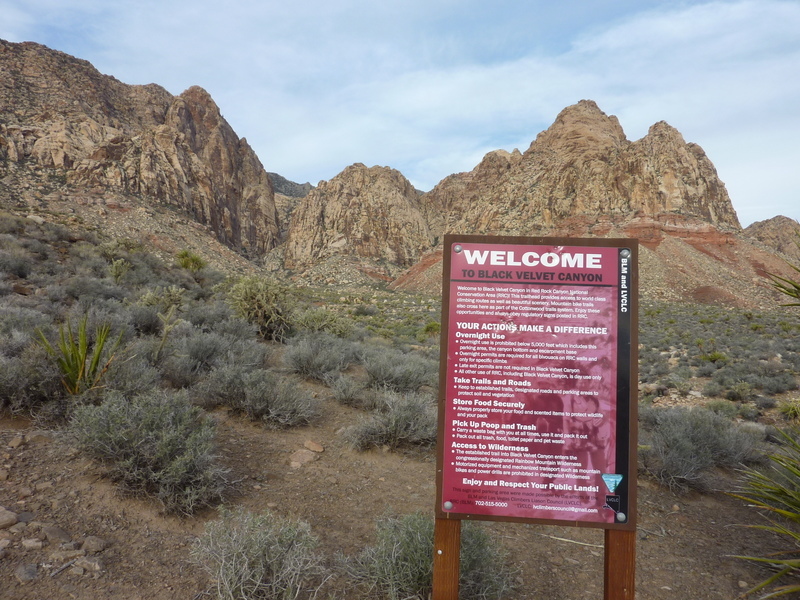 An alternate description might be to head up the north fork of Black Velvet Canyon, heading northwest towards Veterans Peak and The Monument. At the next fork, head left - this is the east gully Courtney describes and is in fact, east of Burlap's summit (though it feels like you're more northeast). There are several ducked use trails, one on either side of the creek that converge at this second fork, one of these the trail we contoured along. The right fork is a highly enjoyable (and ducked) route to Veterans/The Monument that Tom and I had used a year earlier. The left fork heads to Burlap. Once we'd figured this out, things went fairly smoothly. We followed ducks up the gully until we literally ran out of them after several hundred yards' effort. Spidey senses tingling, we went back down a short distance to where the (now) obvious ducks took a sharp turn to the left (south) up a steep side gully which would eventually lead to the SE Ridge, very much as described in our guidebook. There were no more miscues after this and we enjoyed the rest of the scrambling, airy at times, all the way the summit. Even with the detours, it took us only about two and a quarter hours to reach the highpoint. The wind was howling and terribly cold in the exposed ridges and on the summit (and I somehow forget to take any pictures on the SE Ridge or the summit), forcing us to take shelter on the leeward side of the summit rocks for our short stay there. The wind would dog us constantly for the next three days with little letup. Our consolation was that it was better than rain. While Tom snacked, I wandered northwest towards the saddle with Hidden Peak, wondering if we'd have been able to climb the east gully to its end at this saddle. The summit ridge looked to roll off easily at first, but soon devolved into some problematic steps that stopped me. Finding the wind too distracting to explore the options more fully, I returned to the summit where Tom was finishing up. We started down the SE Ridge the way we'd come, but 2/3 of the way to the exit gully I was distracted by a set of ducks dropping more steeply off the northeast side of the ridge. I followed these down increasingly difficult terrain for a few hundred feet before it became more like class 4 and harder. Having descended partway himself, Tom watched as I tried several lines before giving up the effort. We've greatly enjoyed finding unexpected routes in the past in Red Rock, but this one looked like either a work in progress or something beyond our abilities. Tom went back up to the SE Ridge while I traversed across the upper flanks of the ridge, eventually joining forces back in the exit gully. From there we followed the ascent route down the exit gully to the east gully with only one minor variation when I found a tunneling option low in the east gully, somewhat brushy, that appears to have been the usual route at one time until a bypass was established sometime later. A few hundred feet below the second fork, we started to traverse east out of the drainage and around the broad SE Ridge of The Monument, looking for a shortcut to East Monument, our second summit for the morning. This bit of trailless, unducked terrain worked out quite nicely in getting us to the prominent chute on the south side described by Courtney and rising to the saddle between Monument and East Monument. We found ducks and a trail almost immediately upon gaining the chute and began following them up. Coming rather soon to what seemed the impasse described in the guidebook, I noted ducks below us to the east that climbed out of the chute. Tom didn't think these were the correct one to follow as they didn't seem to match the description we'd read earlier (but didn't have with us). Nevertheless, I got him to drop back down and follow me and the ducks up and around the south side of East Monument. It soon became clear that this was way off the route, but I continued up, wondering if this was yet another undocumented way to the summit that we'd stumbled upon. Unfortunately, the ducks and the route stopped rather abruptly where we found ourselves staring at massive cliffs on the SE side that offered no apparent way up. Perhaps another route in progress? Back we went to the prominent gully. What we had thought was an impasse turned out to be a simple class 3 scramble with a second look, allowing us much progress up the gully. We could see a very large chockstone near the head of the gully that would make for the more obvious impasse. Tom spotted bypass ducks almost immediately on the right and began to follow them. I wanted to explore the chockstone at the headwall more closely and continued up through some mild brush and across a fallen log, eventually finding what I think was the class 3-4 exit ledge that Courtney described (Tom followed what appears to be an easier class 3 set of ledges below the one I used). I explored the chockstone further a bit later on our descent and discovered that there appears to be a long, but possibly workable tunnel behind the chockstone that would make for an interesting exploration. It was too wet from the recent rains to be comfortable when I looked into it, so I left it as an exercise for future explorers. Above the ledges we reconvened and followed more ducks over easier terrain the remaining few hundred feet to the summit. It was not long after 12:30p when we reached the top, finding one of the usual ammo boxes with far too many entries to bother recording. I cleaned out the business cards and other detritus in the box while we took another short break here - the wind had not relented in the least from its ferocity earlier on Burlap Buttress. It would take us another hour and a quarter to retrace our steps back down the main gully on the south side and then back across Black Velvet Wash. The ducked trail ran out well before reaching the wash, resulting in some meandering to get across with a minimum of brushiness, eventually finding the well-trodden main trail on the south side that led back to the TH. These are the southernmost sandstone summits in the Red Rock area. Given that it was almost 2p, we decided to tackle them via the easier approach from the west rather than another involved class 3-4 scramble from the east. It took us something over half an hour to cover the 7.5mi back out to SR160 and then west to Mountain Springs and the TH. With the Jeep we managed to drive the last third of a mile on a steep dirt road to the top of a small telecom hill described in the guidebook. From here, a very good trail follows an undulating ridgeline to the crest of the range in 2/3mi. Turning right, we then followed a lesser trail marked by regular ducks southeast along the limestone crest to the backside of Hollow Rock and South Peaks. There is some scrambling to be had once one crosses onto the sandstone layers, ducks amply providing direction in case one has any doubts on what we thought was a fairly obvious route. We spent just over an hour to reach the impressive summit block of Hollow Rock, with the only reasonable scrambling route found on its northwest side. The downside of this backside route, we came to find out, at least for today, was again the wind that blew harder yet across the limestone crest during the approach. Getting from Hollow Rock to South Peak is pretty straightforward, even without a single duck to guide you. The strongest winds we encountered all day were blowing through the saddle between the two summits where I found I could lean at something like 10-15 degrees into the wind without falling. South Peak was easily the least interesting of the four peaks we visited, having taken but half an hour to get there from Hollow Rock. It did sport some nice views of Potosi Mtn to the south across SR160, however. The last hour would be spent retracing our route back along the crest and down the ridgeline to the TH, finishing up at 5p.